This illustration shows how radio transmissions from planetary missions can be employed to study the corona of the Sun. This technique can be performed on rare occasions, when a spacecraft is located at superior solar conjunction – meaning that Earth, Sun and the spacecraft lie on the same line, with the spacecraft located on the opposite side of the Sun with respect to our planet. 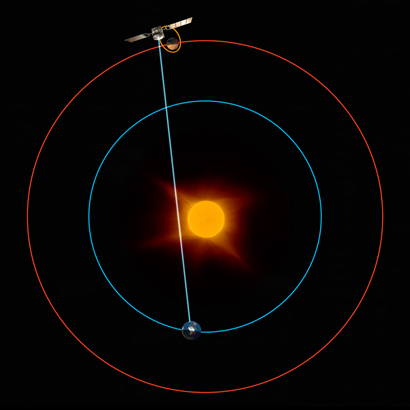 In the illustration, Mars is in superior conjunction and radio signals sent out by Mars Express, ESA's mission in orbit around the Red Planet, pass through the solar environment as they travel towards Earth. Along their path, the radio signals encounter the corona, the hot outer atmosphere of the Sun, which consists of turbulent plasma at temperatures of millions of degrees. Electrons in the coronal plasma interact with the radio signals, causing a frequency shift that can be measured on Earth and analysed to infer the electron density in the corona. Radio sounding measurements of the solar corona were performed with Mars Express during the conjunctions of Mars in 2004, 2006 and 2008. This technique complements direct imaging of the corona in visible light.